Splatoon 2, meet Squidboards 2! Discussion in 'News & Features' started by Warchamp7, Feb 5, 2017. 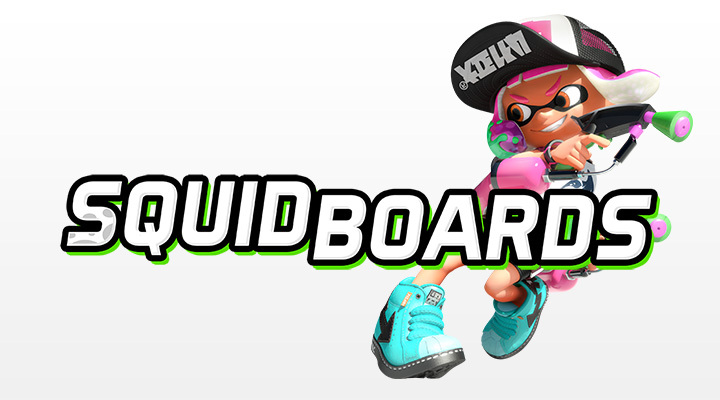 Today we're proud to announce a visual overhaul to Squidboards! To prepare the site for the freshness of Splatoon 2, we've given the whole site a fresh coat of ink. We hope you enjoy the new look! Along with the visual changes, there have been a few structure changes to the site as well. The old Maps, Weapons and Gear boards have been merged together under Competitive Discussion. As well, Regular Discussion and Multiplayer Discussion have been merged together into Regular Discussion. These forums are now grouped together under the Splatoon 1 category, and a new Splatoon 2 category has been added. Booyah Base now houses the forums that are not game dependant. These adjustments were made to consolidate things into fewer forums so that discussion is more focused. Let us know what you think! Finally, the biggest change with this update is a brand new homepage for Squidboards. Visiting Squidboards now gives you an easy look at the map rotation, upcoming events, active discussion and the latest news and content from the community! Our goal with the new homepage was to give new and veteran users alike a great landing page for Splatoon. Be sure to point new players to Squidboards to get a jumpstart in the scene, and tell us about other things you'd like to see on the homepage. In the coming weeks, we'll be looking for some additional volunteers to help with moderation and keeping the homepage updated with fresh content. Keep an eye out for that if you're interested. Thanks for reading, and happy splatting! ChaoticEnergy, -Lily-, Savage and 20 others like this. ChaoticEnergy and Slurmp like this. ChaoticEnergy, GreenC022, SaltyCal and 1 other person like this. ChaoticEnergy and Ikaheishi like this. I'm really loving how fresh the site looks. Like TeddyBearYoshi, I do miss my dark blue them. :,( But I think these new ones are also pretty amazing. When I first switched over, I thought it was a little bit weird and different. However, the new themes certainly grew on me as I used them more. I think it'll be the same way for a lot of people. So, give them a shot, at least! It still exists? Because it doesn't show up on the list of themes for me anymore. ChaoticEnergy and Kbot like this. Edit: It actually doesn't show the old styles there for me, either. But that's alright. I'll just have to get used to these new fresh styles. It looks good and I agree on the consolidation of forums, but it's still really laggy for me and at least of handful of people I've spoken to about it. Fewer pages I need to load the better, but I'm stil not sure I really want to commit to being part of squidboards versus just using reddit and discord. Yes, I agree that this site has always been really laggy for me. I'm not sure if this is on all devices, but I've noticed the site loads quite a bit faster with this new updated look. Great oogly moogly were my eyes not prepared! Liking the merges. Makes a lot more sense than the setup you had before that felt redundant. I'll have to feel out the difference in mobile and desktop versions then get back to you on anything else. Slushious and Warchamp7 like this. I wish there was a yellow theme (yellow is my favorite color), but I like the new look and organization. I like the new light blue lite theme with the pink. It looks like cotton candy! My only complant might be the font headers for forum categories. Those fonts don't say Splatoon to me at all. But other than that cool. The white font on the nav bar is a little hard to read on that bright green, but that could just be me. I'm using the dark version of the new theme since it's a bit easier on my eyes. Will the Octoboards theme be coming back? According to @Warchamp7 , yes it will! !